At what point does home not really feel like home anymore? I remember when home was a place I longed for during extended trips abroad or something I marvelled at when I returned, a little more worldly and a lot more appreciative of the city I was declaring as my place of residence on my immigration slip. Vancouver, BC was that place for more than 12 years. I moved there following 3 months of beach huts and guesthouses in South East Asia. Broke but ready to live on my own for the first time at the ripe old age of 23. For the next 8 years I would live on the corner of Harwood and Nicola in Vancouver’s whimsical West End. My neighbors ranged from folks who had lived there since the very first pride parade marched down Thurlow Ave to independent filmmakers, punks and pensioners. A block from the beach, I thought I’d live there forever. Eventually I migrated to the other side of town to shack up with my now husband, still basking in my city’s reputation as the most liveable place on earth. And it was. It still is, in a lot of ways. But like all good things, that chapter was coming to a very natural and amicable conclusion. I had hiked its trails, skied its mountains, and soaked up its ocean shores. There was nothing left to look forward to as life became kind of cyclical. As the late B.B. King would croon, the thrill was gone. It was the 4th of July weekend in 2012 and I was finishing up at a conference in San Diego. Having not spent time in Los Angeles in a while, I was eager to reacquaint myself with Vancouver’s cinematic sister city. So I convinced my husband (then fiancé) to meet me in Venice for a few days. I can’t really describe it, but as I was sitting on a patio waiting for my husband to arrive, observing all the sun-kissed surfers and nouveau bohemians blow by me, I distinctly remember feeling like I was home. Fast forward to May of last year, floating listlessly in a West Hollywood pool praying time would stand still, as my husband monitored his phone to make sure we wouldn’t miss our flight home to Vancouver. Again, that feeling. Like we shouldn’t be leaving at all. I declared right then, perched on a pink pool floatie, hazy from the unnecessary Pimm’s cup at breakfast, that one day we would miss our flight home. One year later, we did. It’s been exactly 3 months since we missed that flight. And we’ve settled in Venice, precisely where I silently predicted we would 3 years ago. I’ve lived outside of Canada before, but this time it doesn’t feel like I’ve left something behind, aside from friends and family of course. With every hidden mural, underground tavern or new walk street to discover, everything about being here feels natural and familiar. Maybe it’s because there are so many similarities, at this stage of Venice’s evolution. Like Vancouver, cars aren’t necessary in Venice. Neither are heavy winter coats, fashion-forward clothes or having to look far for the nearest community garden. Venice is undergoing considerable gentrification, much to the chagrin of some of its long time residents. The man who runs our local plant shop tries to warn me about the dangers of living here, every time I pop by to replace another succulent I’ve killed. What he doesn’t know is the city I came from has the same income inequalities and clashing of cultures Venice is experiencing now. One of the most impoverished streets in North America sits a short 10-minute walk from my former high-rise address in Vancouver; a neighbourhood where tiny condos quickly sell for a cool million, sometimes thousands of dollars over asking price. In Vancouver, displaced people struggling with drug addiction and mental health issues live in and among some of the cities most touted hot spots and eateries. The same thing is happening in Venice. 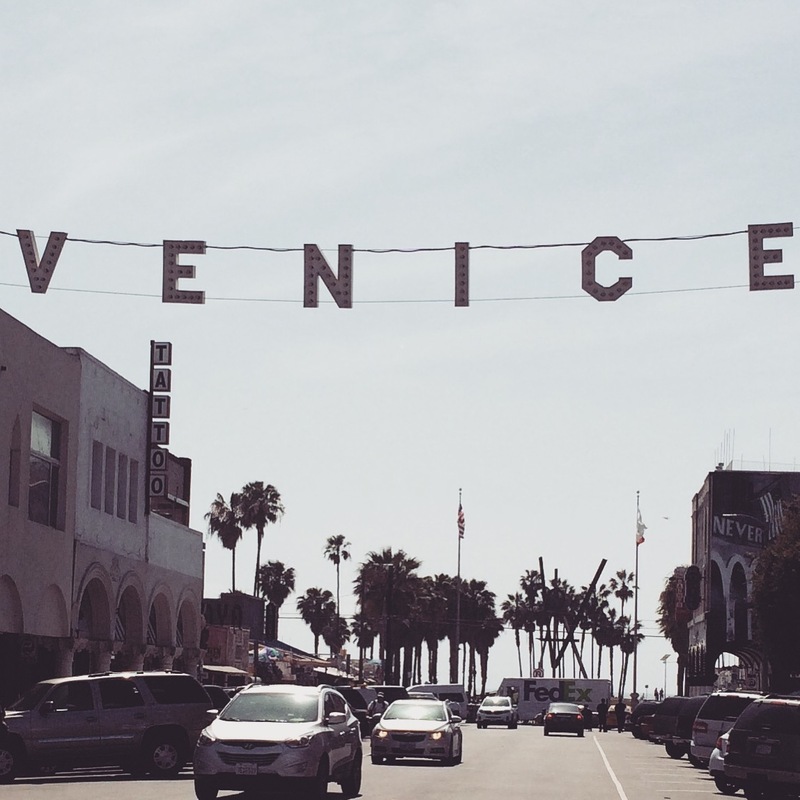 Similar to Vancouver, Venice is far from perfect, despite having one of our main thoroughfares being named the coolest block in America. There are often LAPD choppers buzzing above our little mid-century mod apartment in the middle of the night. Gang tags can suddenly appear everywhere, but are quickly painted over by storeowners. Power lines obscure the otherwise perfect palm-lined skyline as I look towards the beach from our kitchen window. But Venice has soul and character and a history that has inspired some of the most prolific artists and musicians of the last 100 years. The creative fervor in the air is so intoxicating it’s hard to resist. So for now, she is home. And I grow to love her more each day.